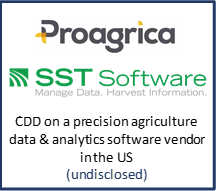 AMR International is delighted to congratulate Proagrica, part of RELX Group, on the announcement of the agreement to acquire SST Software. AMR International conducted the Commercial Due Diligence on this US-based provider of precision agriculture solutions that delivers insight and decision support to agronomic advisors and growers. The CDD focused on the size of the opportunity and the competitive landscape in targeted customer segments including major agriculture retailers, input manufacturers, agronomy service firms and growers.